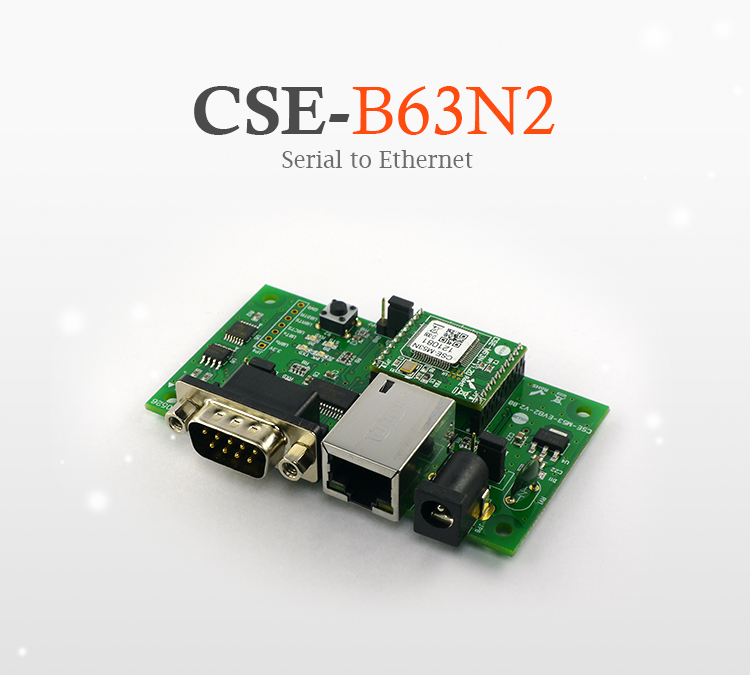 CSE-B63N2 is an embedded RS232/RS485 to Ethernet board which CSE-M53N is integrated. CSE-B63N2 is offered with an evaluation board and it becomes much easier to embed CSE-M53N in your system by getting rid of the time burden to build an additional circuit on your own. The basic concept of this RS232/RS485 to Ethernet board is quickly and easily adding networking capabilities to your serial equipment, which helps you remotely control and monitor them from anywhere in the world. As well as general functions, it provides developed features such as security options (SSL3.0/TLS1.0, IP filtering, Password), a separator for packet fragmentation, and particularly IPv4/IPv6 dual stacks that make you be prepared for moving forward to next generation Internet protocol, IPv6. Thanks to these benefits, CSE-B63N2 can be used for various industrial applications: RFID System, Remote Monitoring System, Extending distance between two devices through the LAN, etc.